I am so very happy with the work and outcome. By Susan & Matthew K.
You want your home to be safe and secure; Matt’s goal is to ensure it is by leveling and lifting any uneven concrete. Concrete settlement is common and can cause significant problems like trip hazards, pooling water, and cracks. Our PolyLevel® is a high-density polyurethane that raises slabs back to a desired level. It can be used for sidewalks, driveways, garage floors, and porches. Bringing a comprehensive, personalized approach to every job, Matt will evaluate your areas of concern and provide a solution to quickly and effectively stabilize your sinking, settling concrete. Matt’s customers continually recommend him and the Ayers Team to their family and friends. Matt has completed extensive training to evaluate your waterproofing, foundation, and crawl space repair needs as well. In addition, as part of the service team at Ayers, he responds if you need help after installation and to do annual maintenance. “I always want my family to be safe and comfortable in our home,” Matt shared. “I want that same level of safety and comfort for my customers as well.” That’s the thought that he carries with him throughout every customer interaction. Matt lives in St. Johns, Michigan with his family. He is involved in his community, and has been a dean at Rock Lake Christian Academy for summer trips and development of our youth. Additionally, Matt enjoys camping and kayaking in the summers with his family. 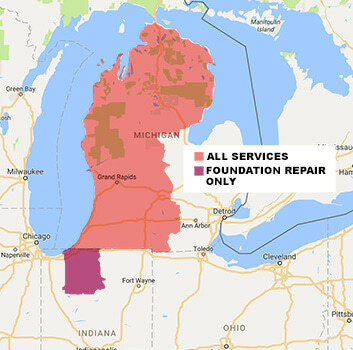 A customer in East Lansing came to us because getting in and out of the driveway involved driving over a big uneven spot. They called us to install our PolyLevel technology which would level out the whole driveway so that their driveway would be smooth as butter. PolyLevel is a foam that we inject into the slabs of concrete through very very small holes. Then, that foam raises the concrete and makes it stronger than ever. So, now this homeowner can go into their driveway with ease. Lee, a homeowner in Charlotte, MI grew frustrated as the cement in front of his home began to settle. Lee’s family and friends suggested he replace the concrete, but he wanted to look around and make sure he chose the best option available to him. Seeking a superior and less invasive fix Lee called us! We prescribed our unique product offering PolyLevel to return Lee’s cement to its original position. PolyLevel raises concrete through unique qualities of expanding polyurethane foam, making it: environmentally safe, affordable, waterproof to prevent future erosion, quick and mess free, and a permanent solution! PolyLevel not only results in a solution that looks better and lasts longer, it is also less destructive to the applied surface. Thanks to this permanent solution, Lee’s cement is level once again. Our friend, Don D. from Kalamazoo, MI is no stranger to the Ayers Basement Systems family. He believes in the quality work we do and has invited us back to his home several times to complete various different projects. That’s why Don called us again when he became worried about the major mold concerns developing below his home. Mold can develop in your home in a variety of ways. High humidity and water leaking in create the perfect breeding ground for mold, and ultimately, this hazardous allergen can create aesthetic and respiratory ailments alike. Removing mold from your home is crucial for the health and well-being of everyone inside. Our team of expert crew members can help. We have developed an innovate solution called Mold-X to promptly treat the mold that may have grown in your basement or crawl space. In order to prevent mold from growing back after using this product, the treated area must be kept dry and without humidity. This is why we offer this affordable treatment along with our waterproofing services. Call us today to set up your free home inspection appointment!